You can make the TC Electronic Corona Mini chorus pedal sound like virtually any chorus pedal ever created, and it's small enough to fit even on highly packed pedalboards. With TC's TonePrint technology, you can download custom effects created by guitar legends like John Petrucci and Paul Gilbert. Or use the TonePrint Editor to create your own custom effects - guitarists are continually amazed at the variety of effects you can create with this powerful editor. 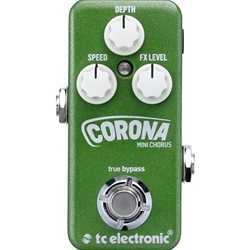 If you only have room for one chorus pedal in your guitar rig, you'll be well served by the TC Electronic Corona Mini.